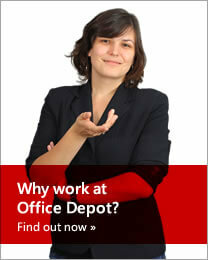 You’ve decided to apply to Office Depot? Good choice! Read more about the vacant positions and send us your CV. During the recruitment process we need to learn more about your experience, about how and who you are and what you enjoy, about your dreams and wishes for the future. And would be nice if you ask us something as well. There can also be a variety of tests, interviews and presentations. In the recruitment process we will check your knowledge, abilities and skills that are needed for the vacant position. Looking forward to meeting you!